European Mind & Metabolism Association - How can Industry and Academia interact? How can Industry and Academia interact? Industry and Academia can interact to develop new drug compounds and new tools that are a. useful to ameliorate the quality of life itself or b. (much better!) products to be sold on the market. While Industries are "private" companies that perform applied research, mainly to patent new therapeutic approaches when they are likely to lead to profit, the Academias are "public" entities that search for basic knowledge, to shed light on the biological mechanisms of psychiatric and behavioral diseases. 2010 - Abstracts have been just presented to the Measuring Behavior 2010 congress about two recent experiments (see Experiment Chart at point 6) which were useful (point 6a) to refine the role played by duration of timeout (and of session) in rats' ID task (Zoratto et al.) and (point 6b) to develop and validate the automated home-cage IGT task (Koot et al.). 2008 - The home-cage operant panel was first presented to the public during the Measuring Behavior 2008 congress. 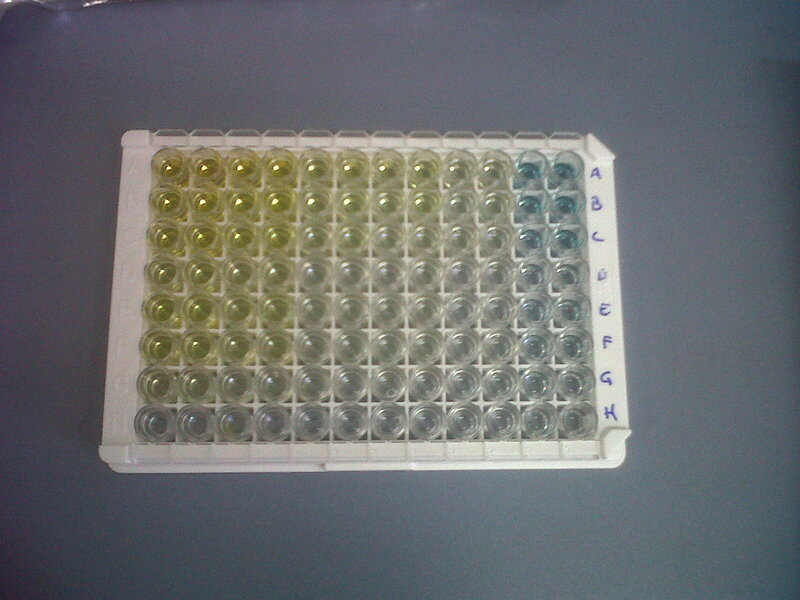 The new DAT-EIA diagnostic kit is almost ready (see successful titration below). The best values are obtained with 1/50 sample + 1/40,000 2nd Ab OR with 1/100 sample + 1/20,000 2nd Ab. Which of these two will be used next time ?